?, Mortimer, son, Isabel, daughter, ? 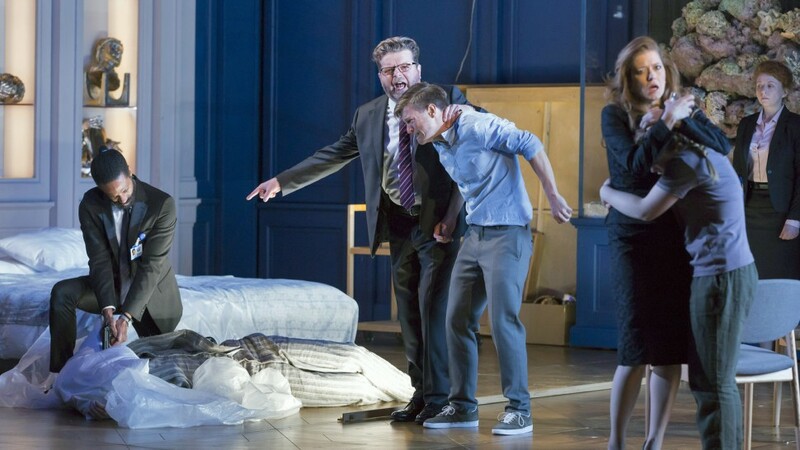 This is a free live stream from the Royal Opera House in London of George Benjamin's Lessons in Love and Violence. It's an historical plot about King Edward II (25 April 1284 – 21 September 1327) who was deposed in a manner similar to what is shown here. We open with two men, the King and Gaveston, buttoning their shirts. The King insists that he must be treated as the King but does not wish to be bothered with politics. There is a giant fish tank and people with clip boards. Mortimer insists and pulls a gun, but he only gets fired for his efforts. Time has passed and Mortimer has returned from a visit to his homeland. "Do not come here trying to put a price on music." He and Isabel are friends. The historical figure Isabella was from Spain, so perhaps that's where he's been. Mortimer brings witnesses back with him to testify of the Kings atrocities. The King gave these people's land to Gaveston. Isabel dissolves a pearl in acid and then drinks it. Why? The King and Gaveston are talking in the bedroom with the King's two children watching from a row of theater seats. These two children, the future King and his younger sister, are in every scene watching everything. Only the boy has any lines. The King and Gaveston begin to make love when Isabel and others enter and sit in the theater chairs. A musical drama about Saul and Jonathan plays. Guns are pointed at Gaveston but no one dies on stage. Gaveston is now dead. This is an emotional scene with people reacting to the death. The King reads a description of how Gaveston died. Daughter likes daddy. Isabel and the children are with Mortimer. She's smoking. An insane man, not one of the other characters, enters and proclaims that his cat has told him that he is King. Mortimer becomes violent. Isabel makes a pass at Mortimer and throws him onto the bed. There seems always to be a bed. Someone has been murdered, perhaps the insane man. The King is brought in blind folded and Mortimer tells him he wants the crown to give to the King's son. The children are there, the clip boards are there, but the King refuses to give up the crown. The man who played Gaveston returns as a kind of angel of death, a common figure in modern British opera. King tells what he imagines it would be like to be dead. The angel tells him he already is dead. The children are already watching. The new King declares, "I have forbidden music." Isabel wants the return of her innocence. Her son puts on the crown. The always silent girl holds up a gun and points it at a bloody Mortimer. The scene goes black. I felt compelled to describe the plot. It seemed to me that only the great Barbara Hannigan was able to make anything of this slow, very much modernist music. I also felt that it would have felt flat and emotionless without the silent girl child expressing her emotions in every scene. The staging made it work theatrically. I was riveted.